Missoula Flying through Denver we picked up the papers on our way to our camping and fishing vacation off the grid in Montana. Depressing! Though well known for a while, reading the story of the AFL-CIO’s proposed sale of their National Labor College was a downer. Not only because of all of the waste but even more so because of the story’s ending in the Times with the tale of a dream not deferred, but deserted and denied. The notion that the college was meant to be labor’s equivalent to a West Point for future labor leaders and to train the members was long gone, but the quote from Kate Bronfenbrenner from Cornell saying in effect that labor just simply needed to scale down its dreams because they just weren’t going to happen, was a gut kick! An article in the Wall Street Journal talked about the fate of another institution that seems to have also abandoned the dream: the Boy Scouts of America. There was discussion about how only 2% used to make to Eagle Scouts. My brother, my son, and myself were all in that number and until recently damned proud of it. Camping and fishing around Rock Creek, Montana about 30 miles as the crow flies – and farther by expressway, paved, and dirt road – building fires, cooking on them, waking with the birds, throwing flies and steel at rainbow and brown trout, chopping wood, building brushfires, refilling propane tanks, working old Coleman stoves, clearing out dead trees, stacking the rocks, making our own Stonehenge of old log pieces around the trailer, we work hard, play hard, and call this vacation! Had years of camping as a boy in the West and South not given me the bug, would this have been where I could find peace and joy in life in the middle of the storms? Heck no! 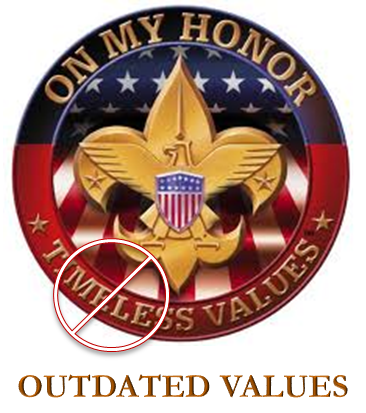 Yet, now the Boy Scouts is robbing many of that experience as it goes all hater on young boys and what their sexual orientation might be and whether or not men and women who have made different life choices and decisions can be involved along with their children. One tragedy after another: I’m glad I won’t be ready the paper for a couple of days! This entry was posted in Ideas and Issues, Labor Organizing and tagged afl-cio, Boy Scouts of America, Cornell, discrimination, Kate Bronfenbrenner, National Labor College, sexual orientation by Wade. Bookmark the permalink.